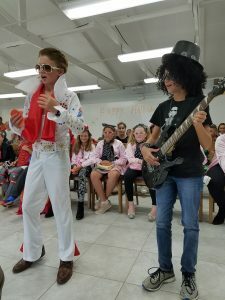 What an amazing Boo Bash on Wednesday night! 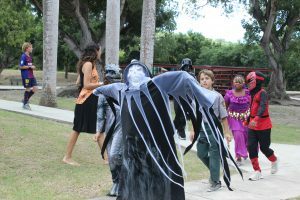 It was extraordinary to see how many students and parents – and community members with no prior connection to our school – attended the event and had a blast. A huge hats off goes to our Parents’ Association for their role in spearheading the overall efforts. 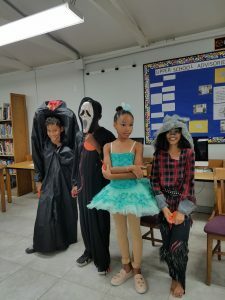 We are also enormously grateful to the many parents, faculty members, and students (the Class of 2019 provided thrills with their haunted house!) who volunteered to make the event such a success. I need not remind folks how far we’ve come since October 2017. On Thursday, parents in Grades 7-12 met with faculty for parent-teacher conferences to discuss report cards from the first quarter of school (please note that Grades N-6 have their conferences Monday, November 12). In a recent upper school faculty meeting, Ms. Grey led teachers through a review of prior report card narratives and they identified ways to make comments more personal and meaningful. This is just another example of GHCDS developing a culture of continuous improvement – we hope you notice a positive difference. 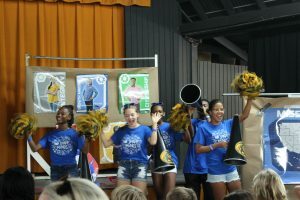 This morning the Parents Association was back at it leading an energetic Pep Rally at Friday Gathering for the upcoming Panther PowerUp Fun Run on Tuesday, November 13. In the meantime over the next two weeks, students in lower and middle school will be participating in the two-week program, which helps develop character and STEAM skills. 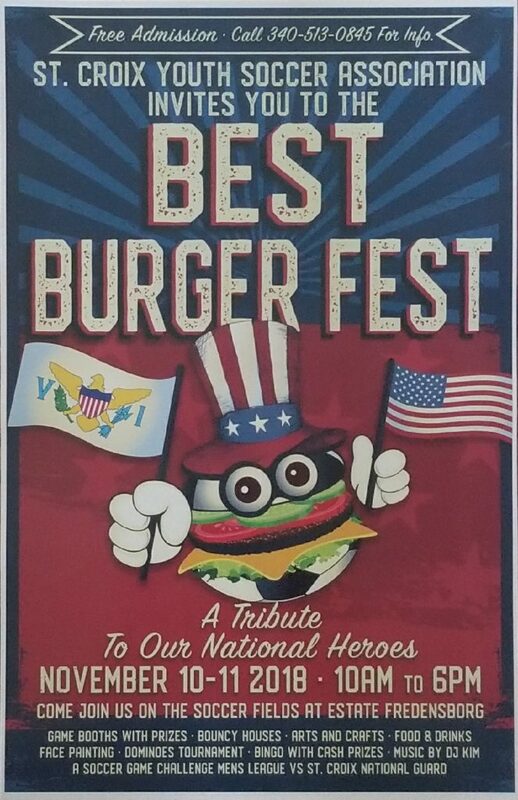 We look forward to seeing you on the 13th! 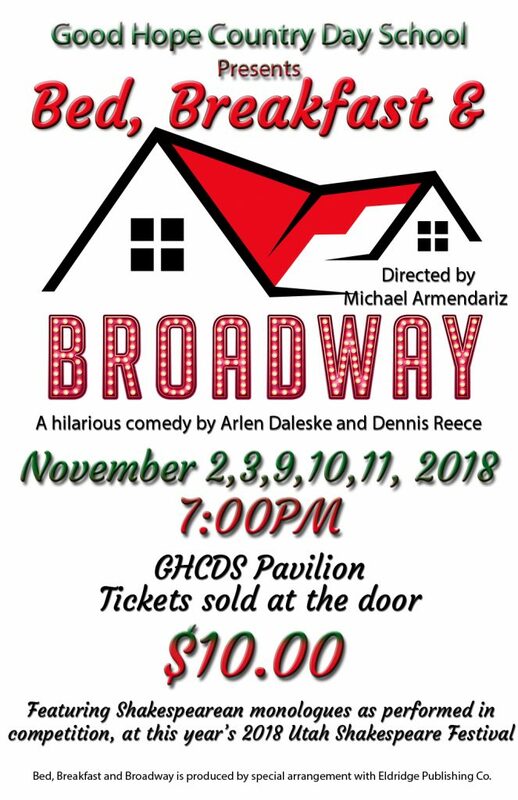 Immediately, our thespians will be showing off their talents this evening for the opening show of “Bed, Breakfast, and Broadway,” an entertaining comedy that the entire family should enjoy. As a bonus, the show will begin with Shakespearean monologues as performed at the 2018 Utah Shakespeare Festival. We are all in for a treat! Lastly, we are continuing our work on the main entry renovation. Please note that the large red wooden staircase coming up from the lower parking lot will probably not be available next week. We ask that you go around – please use either the preschool staircase or the sidewalk on the east side of the faculty lounge to walk up to campus. Thank you again for your flexibility as we work to make our entryway safer, free from water and mud, and more inviting. 1st-6th grade Parent Teacher Conference Day November 12th, 2018. Ms. Bishop ordered a lovely selection of new Halloween books for students in the Lower School. From November to January Ms. Bishop involves 4th to 6th grade students in a mock Caldecott Award selection one year and a mock Newbery Award Award selection the second. This year the students are learning about the Caldecott Award which is presented to the best picture books. GHS alumna,( and son!) Diamond Bishop, supports the program each year by contributing to the purchase of the books under consideration for award. There are always many! What a great way to contribute! Ms. Bishop begins by sharing a book that won the Caldecott Award the previous year – the 2017 winner was Wolf In Snow, by Mathew Cordell. She leads the students in a consideration of the book’s merits: what strikes them as beautiful and meaningful and entertaining. Over the next two months Ms. Bishop will share with students twelve books that are under consideration for this year. Each student will vote for his/her favorite and then compare their results with those of the Caldecott committee. A few books under consideration: Dreamers, Morales, A House that Once Was, Fogliano, Imagine, Colon; Julian is a Mermaid, Love; Nothing Stopped Sophie, Bardoe, Through The Window, Rosenstock. We will keep you posted! 4H dressed up the Middle School Guinea Pig, Cheese Wiz as a taco! Traditional: 1. Kaela Deller (Werewolf); 2. Sarai Gomez (Ballerina); 3. Alex Walcott (Knock-Knock Scream); HM – Aidan Bass (Headless Man). 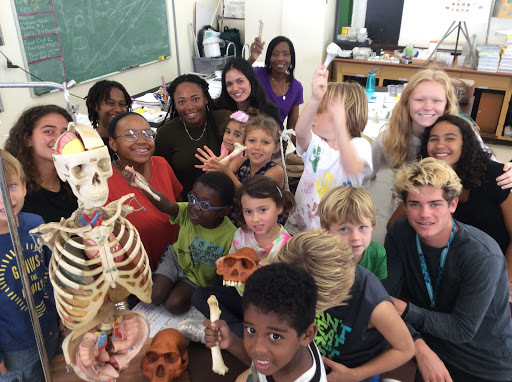 Gwen Lake escorted the Kindergarten class to the Upper School Biology Lab where they examined several different skeletons and discussed bones as part of their “All about me” reflections. Future anthropologists, currently studying Forensics, shared their knowledge of bones with the young visitors. Mr. Loya even stopped by to visit. Brielle Peyton and Victoria Sperber facilitate a play date with some very friendly dogs at the Animal Shelter this Monday when Middle School students give dogs the chance to run about. 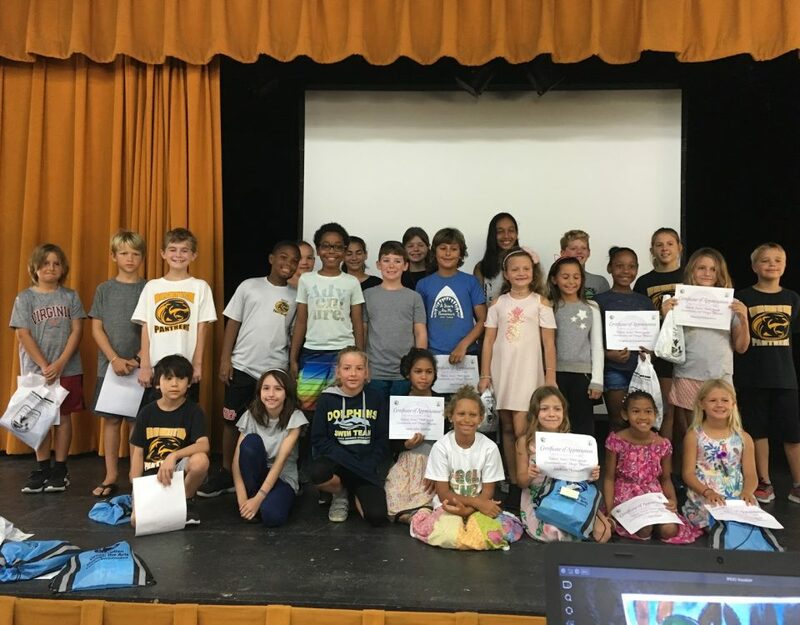 The third graders would like to thank Claudia Lombard, wildlife biologist at Sandy Point National Wildlife Refuge (and mother of two GHCDS students), for sharing her knowledge and experience with sea turtles last week. 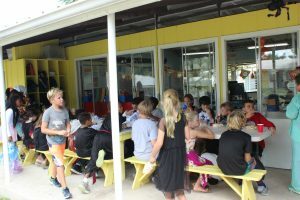 She first came into the classroom to present information about turtles in general and then invited both classes to Sandy Point to learn about sea turtle nest excavation. While at Sandy Point, students learned how biologists collect data by taking measurements of a model turtle. They were then able to witness Claudia and her colleague, Amy Mackay, dig up a hatched green sea turtle nest to count the eggs and check for any remaining hatchlings. Excitingly, there were several! It was an opportunity of a lifetime! During the week of Oct. 8-12, Ms. Thatcher was the guest of New York University, Abu Dhabi campus, in the United Arab Emirates. The 4 day counselor fly-in, attended by 38 high school college counselors from around the United States, gave the counselors an opportunity to learn about the unique programs offered at NYUAD, meet with students and faculty, and tour the surrounding area. A young and dynamic country, the strategic location of NYUAD in the UAE allows for students to engage in international internships both in the UAE and abroad, and to easily travel to many countries. The program is highly competitive yet affords generous financial aid to those admitted. It was very interesting to learn about the school, and Ms. Thatcher would be happy to share her thoughts with any student interested in exploring NYUAD as a college option. The Panther PowerUP! is HERE! 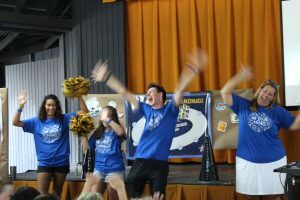 This year’s main fundraiser is the Panther PowerUP! In a nutshell, it’s a two-week program that kicked off with a Pep Rally this morning and ends with a FUN RUN on Tuesday, November 13th . 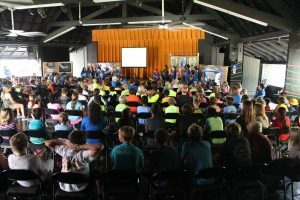 ALL Nursery – 8th grade students will get to experience the fun and excitement of our program and be introduced to this year’s theme: MINDSPARK MYSTERY LAB. Pledging is open! I encourage you to go ahead and register your children on funrun.com. It is a really easy to use site with lots of fun stuff and they will receive a prize on Monday just by registering! Donations will go toward school improvements and to the entire two-week experience. Please help our school by reaching out to sponsors. Over the next two weeks, students will also experience an amazing character theme, MINDSPARK MYSTERY LAB! 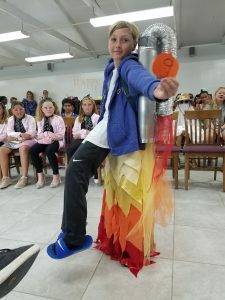 This program combines S.T.E.A.M skills (Science, Technology, Engineering, Arts, and Math) with character-building. 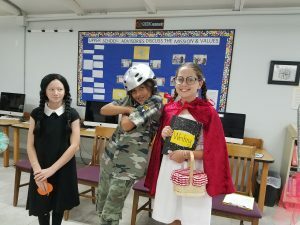 While our students are teaming up with the MindSpark Kids to solve mysteries, they will learn five 21st-century character traits that will help strengthen themselves and our world. PLEASE mark your calendars to come out and cheer on your student(s) at the Panther PowerUP! Fun Run! 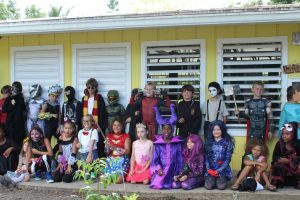 The Parents’ Association would like to say a HUGE THANK YOU to Julie Eckard and the Boo Crew for putting together a fantastic Boo Bash Halloween celebration on Wednesday! Thank you to the Senior and Sophomore students and advisors, the National Art Honor Society, Cowboy Steve, KDM for supplying lights, our Nursery – 8th grade Room Parents, and the countless faculty, parent and student volunteers who put in so much time and effort for our students! What a great community effort! Best of luck to our Cross Country runners, as this Saturday they will compete in Virgin Island Championships at UVI. Our Volleyball Panthers are finishing up regular season, and we’re thrilled with the growth they’ve shown since the start of their season. There is the possibility of an on-island tournament the weekend before Thanksgiving for Varsity. If that is confirmed, we’ll need to be sure all our team members are able to participate before we commit. We’ll be in touch via email as soon as we are sure. Varsity Girls A Team-Setting up for teamwork! Talented and fabulous Seniors after their last regular season match: Lailani “Nia” Canton, Chloe Camacho, Georgia Porter and Nayla Coureur. Elementary Flag Football had the last regular season game this week, finishing with a win over Lew Muckle. The playoff schedule is listed below. Middle School will have the last regular season game on November 7th. Our teams are improving every game, and we look forward to strong performances in playoffs. Elem Flag Football vs. MS Flag Football Full Dress Scrimmage! 3:15 Lower Field. Mouth guards required! MS will wear black jerseys that will be issued at the field. JV Volleyball Practice 3:15-4:30 gym. This is a mandatory practice. Varsity A Teams Volleyball, girls and boys, practice 3:15-4:30. Click hereto BRAG about your student!